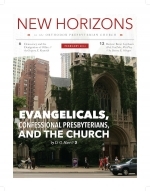 Chances are that most Orthodox Presbyterians think of themselves as evangelical Protestants. For most of the OPC’s history, the larger Protestant world in North America and Europe was divided between liberals, or mainline Protestants, and conservatives, or evangelicals. The book of Daniel can be summarized as “changing kings and kingdoms, but God unchanging.” In the accounts of God’s deliverance of his people in the first six chapters, and in the dreams and visions of the last half of the book, Daniel reveals the profound spiritual conflict that underlies human history.